MU6J2LL/A: Band with 40mm case fits 130–200mm wrists. MU6L2LL/A: Band with 44mm case fits 140–210mm wrists. GPS Apple Watch Series 4 (GPS) lets you send and receive text messages, answer phone calls, and receive notifications when it’s connected to your iPhone via Bluetooth and Wi-Fi. The built-in GPS works independently of your iPhone for distance, pace, and route mapping in workouts. GPS + Cellular Apple Watch Series 4 (GPS + Cellular) has all the same features, as well as built-in cellular. It gives you the freedom to send and receive text messages, answer phone calls, and even receive notifications when you don’t have your iPhone with you. 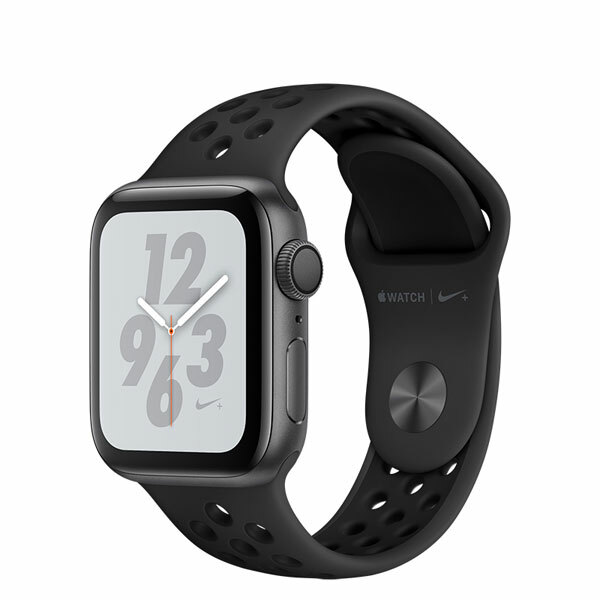 AppleCare+ for Apple Watch and Apple Watch Nike+ extends your coverage to two years from the original purchase date of your Apple Watch and adds up to two incidents of accidental damage coverage, each subject to a $69 service fee plus applicable tax. In addition, you’ll get 24/7 priority access to Apple experts via chat or phone.